This state-of-the-art climbing facility is provided by Tjelmeland Friction. 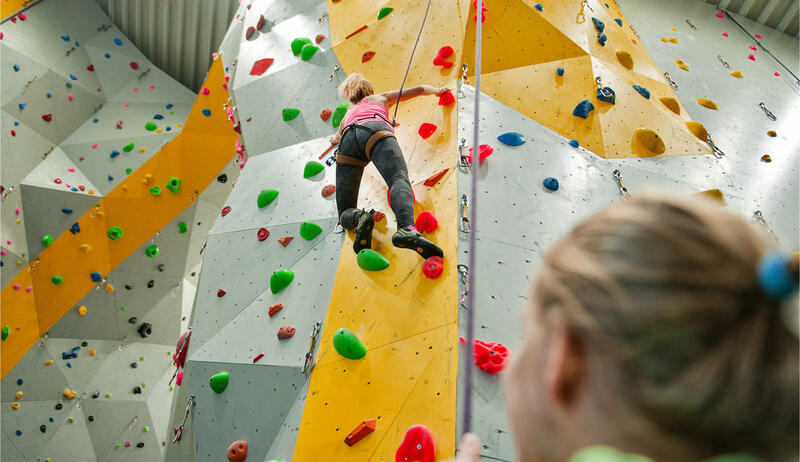 It has over 610 square metres of climbing areas - 70 squared metres for bouldering and around 540 square metres of climbing walls. We have the possibility for 70 routes at any one time, but this number can vary slightly. We have climbing routes with varying degrees of difficulty, set by skilled climbers. How can you climb at Eika? Anyone who wants to climb in this facility must sign a declaration of responsibility. This is done at the reception. We arrange variousclimbing coursesto achive climbing cards. If you want to climb using a rope, you must show the relevant card. Bouldering does not require a card, and can be used by all members or for a one-off fee. Climbing equipment can be hired from reception. Children can climb with adults on Tuesdays between 16.30 and 18.30 (an instructor is available) as well as Sundays between 10.30-12.30 (no instructor). We have climbing guides present on Tuesdays and Thursdays between 17:00 and 20:00. During these times you have the opportunity to get some help with your climbing. In addition, an instructor can take you through what you need to know for the rope climbing card, which costs 100 kr. You do not need an apointment in advance.